Modem mode on iPhone 6: how to enable and configure? IPhone is a universal device that has several advantages, one of which is its ability to act as a modem. Using this phone versions 4s, 5s, 6 and so on, any subscriber can distribute traffic within the network range. This can be done with the help of a special mode, which you just need to activate and make small settings to provide Internet with any device you like, from smartphones to PC. But not every owner of such a mobile device knows how to properly enable the modem mode on the iPhone 6, and this can be done very easily. Sometimes it happens that after installing on iPhone 6, 5s, 4s, as well as its other versions, scheduled updates, it stops its work or various network settings are completely removed. The modem mode ceases to function, or the system constantly hangs on the window of the running processor. This situation is repeated periodically and no user is protected from it. Deleting a modem mode is found not only in 5s and 4s iPhones, but also in 6, since the ninth version of iOS also failed to cope with the problem in question. Updating the phone leads to the fact that the corresponding item from the menu simply disappears, or when you turn on the mobile device completely freezes in a running state. In fact, the modem distribution service does not disappear and is not deleted. In fact, everything looks like Apple simply turned off this feature by default, explaining its action by the fact that subscribers practically do not use this mode. But this is not all reasons. The disconnection of the considered function was carried out in order not to bear responsibility for its work, taking into account the peculiarities of Internet settings, operators of various states of the whole planet. In fact, a large number of users are accustomed to using iPhone 4s, 5s, 6 and other versions as an access point, the removal of which makes them almost helpless. For example, during trips it is much more convenient to work on a PC, getting Internet from a phone, without using other complicated and inconvenient routers. That is why it is necessary to find the answer to the question of how it is possible to restore the possibility of distributing Internet traffic using the iPhone. 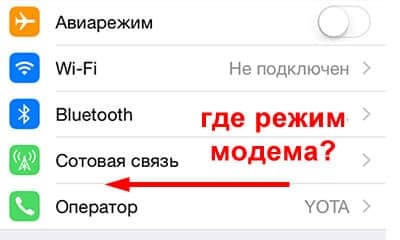 In case when iPhone 6, 5s, 4s, or other versions of this smartphone, namely iOS 9, the modem connection stops functioning, the subscriber should first turn it on, and then manually write the data of his operator. Need to find in the settings of the department of cellular communication. Then find the line called "Modem Mode" and change its state to enabled. After activating the modem mode, the subscriber should enter the settings of the used operator by filling in the appropriate fields, as well as the tabs of cellular data. Beeline subscribers in the first paragraph called APN should enter beeline.ru, in the next field, the name of which "Username" is entered beeline, the third, where the password should again contain the text beeline. Tele2 clients do everything much easier: you need to enter tele2.ru in the APN field, and you do not need to fill in the other two lines with the name and password. Yota users need to fill in only the first APN field by typing the phrase yota there. The people serviced by MTS should write internet.mts.ru in the first line, and mts in the second and third. For Motivtelecom subscribers in the first field you need to write inet.ycc.ru, and the other two should be motiv. 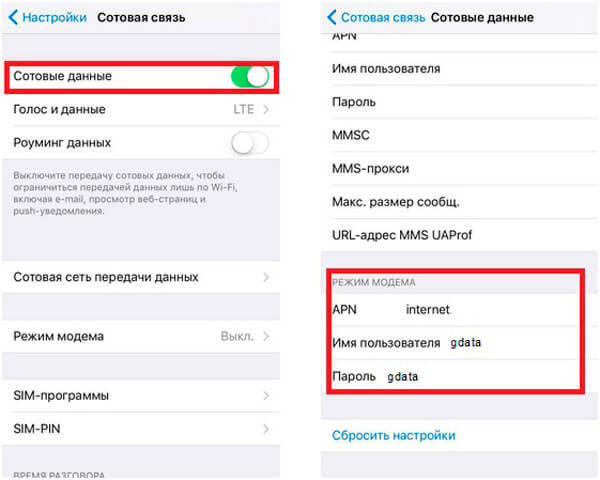 After filling in the iPhone 5s, 4s and its other versions of the settings of the cellular operator, the modem mode service becomes available for operation. You can find out the necessary modem settings of other mobile operators directly from them by calling the hotline number. Also, you should pay special attention to the fact that when the modem is running, this mobile device will automatically distribute the Internet traffic of the PC, whenever you connect with a USB cable. This will happen even in the case when this is another sync, provided for organizing backup copies using iTunes. Therefore, it is better to disable the considered option when it is not in use, because the fee for its use continues to be removed, and by disabling it, you can save your own money. Appsgames⟾IOS tutorials⟾How to enable modem mode on iPhone 6?